"As you know, the investigation into the causes of the incident by the national prosecutor's office and a specially established expert subcommission is continuing in Poland. At the same time, contrary to the conclusions of the Interstate Aviation Committee, the Polish State Commission on Aircraft Accidents Investigation and just common sense, irrational versions of the crash still appear, including claims of kind of explosions on board the presidential airliner and a lot of others, especially in media, there are versions, speculations, insinuations and so on", Zakharova said at a briefing. On Wednesday, the Polish commission responsible for the re-investigation into the crash headed by former Polish National Defense Minister Antoni Macierewicz, said that an analysis of over 2,000 tests by a police forensic laboratory showed that there was a blast on board the presidential plane, as traces of explosives were detected on 107 out of 215 samples from the crashed aircraft. The spokeswoman noted that criminal proceedings were initiated in Russia for the crash, while the investigation was entrusted to the Russian Investigative Committee, and it was yet to be completed. In April 2018, the Polish commission revisiting the investigation into the 2010 plane crash issued a report saying that it was caused by a mid-air explosion on the aircraft. The commission also said in June that it had found traces of explosives on the aircraft wreckage as well as on the body of one of the victims of the crash. 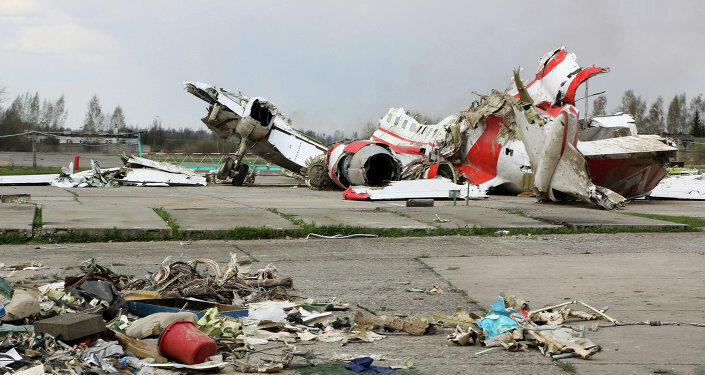 On 10 April 2010, a Russia-made Tu-154M passenger plane carrying Kaczynski, his wife, and a number of high-ranking Polish officials crashed as it attempted to land at an airfield covered in heavy fog near Smolensk. None of the 96 people aboard the plane survived.